This recipe is adapted from a Cooking Light recipe. I have been making it for more that 10 years now and people always want the recipe. It also freezes well. Preheat oven to 350°. Cook pasta according to package directions, omitting salt and fat. Drain the pasta, and set aside. Remove casings from sausage. Cook sausage, onion, and garlic in a large nonstick skillet over medium heat until browned, stirring to crumble. Add the tomato paste, salt, pepper, and tomatoes, and bring to a boil. Cover, reduce heat, and simmer 10 minutes, stirring occasionally. Combine cooked pasta, sausage mixture, and basil. 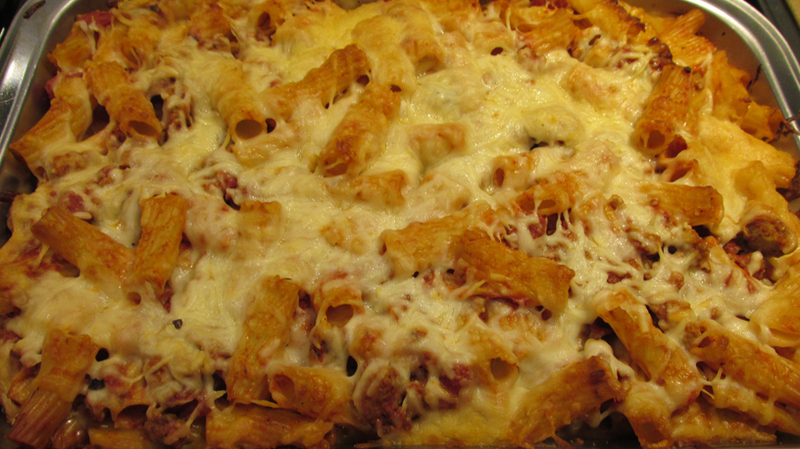 Place half of the pasta mixture in a 4-quart casserole coated with cooking spray. Top with half of mozzarella and half of Parmesan. Repeat layers. Bake at 350° for 25 minutes or until bubbly. Fire roasted tomatoes- that’s interesting! Yum. What is a fire-roasted tomato? Most grocery stores sell cans of fire-roasted diced tomatoes. i get the ones without the herbs or garlic. Del-monte is my favorite.